The angalkuq (shaman) would see somebody’s movement for a particular word and he would say “Yes, finally, that’s the one I want to use for—to depict this word.” And that’s how they did—they used these [movements] with the masks and the dance fans. 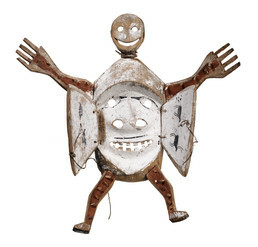 This transformation mask depicts a human figure with outspread arms and legs. The limbs are also mouths, painted red inside and studded with peg teeth. A semi-human face is carved on the outside of the doors, which opened dramatically when a dancer pulled on the sinew cords. The face revealed inside is the yua, or inner person, of the creature. It has goggled eyes and a mustache. Two seals are painted inside one door, two caribou on the other. The mask originally had feathers inserted around the body and a fringe of caribou hair on the head.